Angul: Thousands of employees, workers and people from the periphery villages paid their tribute to the architect and founder of O.P. Jindal Group, Shri Om Prakash Jindal (Respectfully called as Bauji) by one and all, on his 12th Punyatithi (Death Anniversary) today. People from across the age group came to attend the 24 hour long Ram Charita Manas recital programme organized in the township and paid floral tribute to the divine soul. 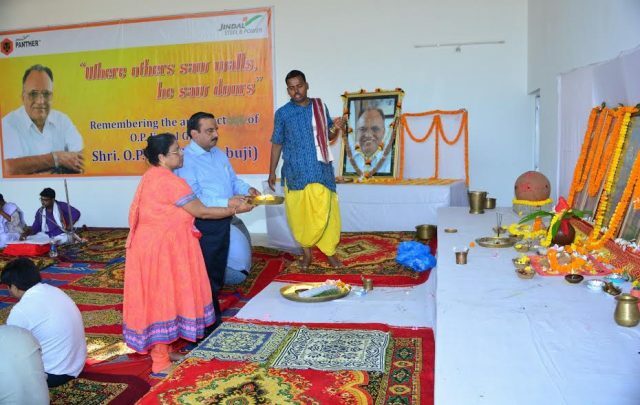 Early in the morning JSPL’s Angul Location Head and Executive Director (i/c) Mr. Dinesh Kumar Saraogi and President of Jindal Mahila Samiti (JSM) Mrs. Sujata Saraogi paid their homage and participated in the Ram Charita Manas recital programme. Continuing the practice of voluntary blood donation on Bauji’s Punyatithi, hundreds of followers who believes in social service and helping the needy people at the time of their need, donated blood to cater one of the emergency requirements in saving a life. The blood donation camp, organized with the help of District Blood Bank Angul was inaugurated by the Executive Director Projects (Phase 1B) Mr. Bharat Rohra in presence of Mr. Damodar Mittal, EVP-Phase 1B; Mr. Suresh Kumar Sharma, VP and other senior officials. As a mark of respect, Mr. S.K. Sharma donated the First unit of blood followed by Mr. Satyabrata Mahapatra, AVP and others to make the tally 103 units. Remembering Bauji, Mr. Saraogi said, “Shri Om Prakash Jindal Ji is our source of inspiration and our pillar of strength. He was a visionary with impeccable business excellence, who envisioned the dream of a self-reliant India. His journey from humble beginning to being amongst the most successful Self-made Industrialists of his times, a philanthropist and a Social Change Maker will continue to be a source of inspiration for generations to come”. District Blood Bank Officer Dr. Biswajeet Samal along with Coordinator Mr. Prafulla Das; JSPL’s HR & ES Head Mr. Praveen Kumar; Chief Medical Officer Dr. B.K Das and employees from Phase 1B,CSR,IR,HR and Medical of JSPL coordinated the blood donation camp and programme. On this occasion, Jindal Mahila Samiti led by Mrs. Sujata Saraogi distributed food items at various charitable institutions. Shri OP Jindal is not only known as a business leader and industrialist of India, but also he is famous for his social service activities. He was serving as a Minister of Power in the Government of Haryana at the time of his death. He was also a Member of Parliament to 11th Lok Sabha and been conferred with the prestigious ‘Life Time Achievement Award’ for his outstanding contribution to the Indian Steel Industry.